The month of November has just arrived with its generic glimpse of winter. We welcome this month with an evergreen and hot topic of cancer research. This time we intend to introduce you to an old research topic with a new vision…..
Cancer being an ailment with no remedy of full confidence has been pursued as a career by a lot of researchers. A cell biologist says it is an uncontrolled proliferation (increase in number by division and growth) of cells, molecular biologists call it a mutant variety of some biomolecules forcing a cell to commit such an uncontrolled cell division cycle. But, how does a Systems Biologist see such kind of a problem? Let us try to pursue it in a different way. 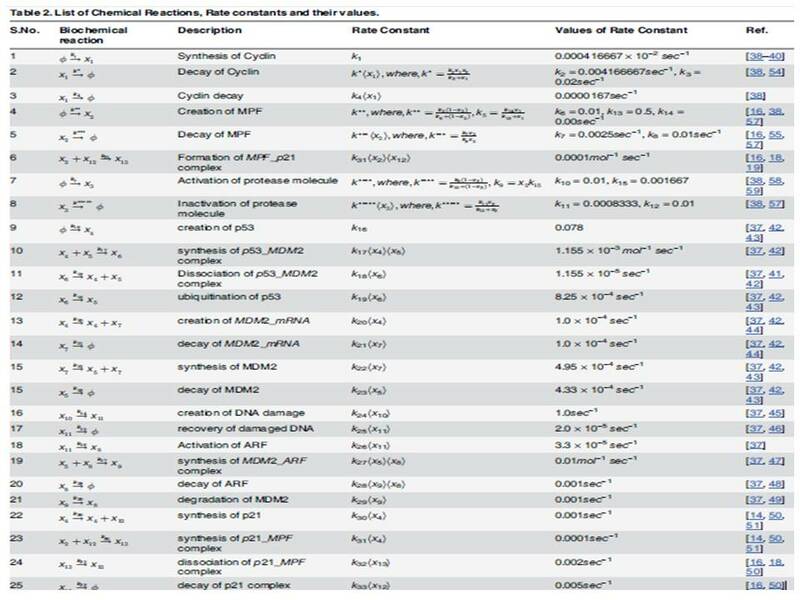 Proteins if are not assigned some name based on their function or structure, scientists mark them according to their molecular weight, e.g. p53, p200, p19 etc. Scientists have proven an abnormally high expression of p53 protein in Cancerous cells/tissues. p53 protein is actually the reason behind those other proteins which regulate the cell cycle and makes it to divide in to two as a normal scenario, p53 also helps in the manufacture of its inhibitor named Mdm2 protein. In any case of mutation in p53, that leads the failure of abnormality recognition by p53, doesn’t lead to increase in p53 and consequently Mdm2, p21 and other p53 regulated proteins. And thus, the division of abnormal cells continues indefinitely and causes Cancer. From a Mathematical Biology perspective, systems biologists form some ordinary differential equations that look like a mathematical formula. These mathematical formulae are actually nothing else than the representative of chemical reactions and their combinations occurring inside a cell. 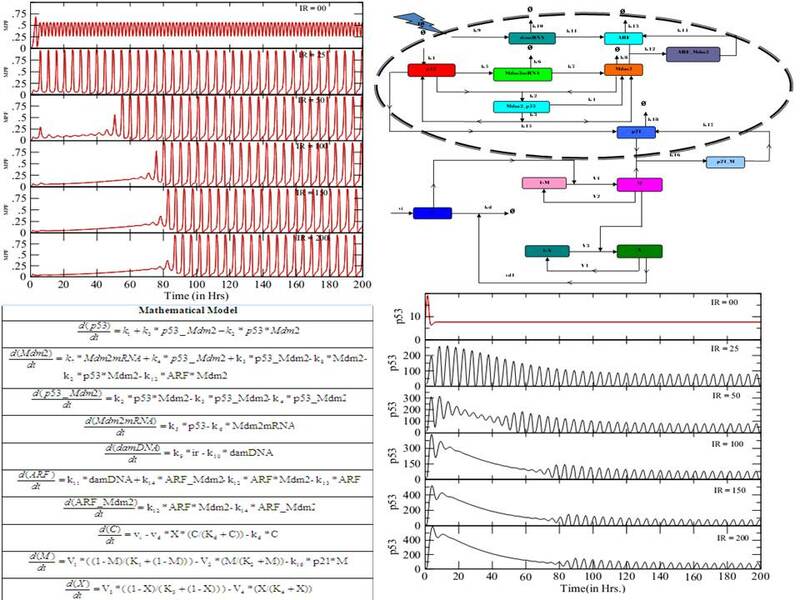 As in our previous blogs (by Fozail Ahmad), we have mentioned about how to combine the chemical reactions in a shape of Ordinary Differential Equations (ODEs) and about how we follow Zero-Order chemical kinetics (reaction rate doesn’t depend on any participating chemical), First-Order chemical kinetics (reaction rate depends on only one participating chemical) and Second-Order chemical kinetics (reaction rate depends on two or more participating chemicals) to form the equations. In addition to that, I would like to mention that there are some reactions which occur with the help of some biomolecular machineries. These machines (enzymes) just help the reactions to occur, but do not take part in it themselves and thus affect the reaction in a different form of kinetics as described by the combined work of German Scientist of Biochemistry Leonor Michaelis and Canadian Scientist of Physics Maud Menten in 1913. So, in a normal cell, when p53 senses the danger and signals the Cell by increasing p21 to combine with PCNA (Proliferating Cell Nuclear Antigen – An enzyme that helps in cell division) it stops the cell division. This type of cell cycle division has been shown in one of the diagrams mentioned below, while for the mutated case of p53 where it can not sense the cellular damage and thus divides normally is also shown in one of the images above. We have also mentioned a combined picture, which shows a referral of how different stages of Mathematical Biology looks like. These figures are in special contrast to Cancer cells and normal cells. Mr. Sanjay is currently a Doctoral student at Department of Computer Science, Jamia Millia Islamia. He is a Dreamer of Science and lives his life in Love with Science. His research experience includes the exposure of some of prestigious and well known research/academic institutions of India like Indian Agricultural Research Institute, SCIS JNU, Hansraj College, etc. He aims to contribute in science and dissolve the boundaries worldwide for same. Although he loves to stay in lab for most of his time; but when the chair is seen blank, you may find him some where in the play ground with his football. Previous Story Previous post: DNA test for paternity: This is how you can fail!